Adorable Lake Front Home with 115 Ft of Private Beach. Enjoy a relaxing stay at this year-round vacation home. The location offers a great 'up north' getaway or family retreat. 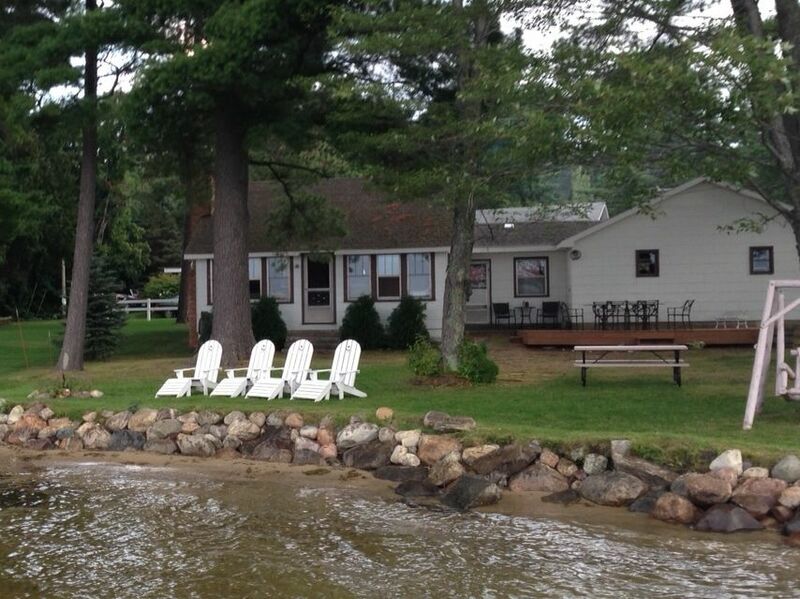 The house is located on Fife Lake, a 660 acre all sports lake, offering a large variety of water activities. Traditional hardwood tongue & groove knotty pine throughout. Fully equipped kitchen with full size refrigerator freezer and microwave, washer & dryer, TV/VCR, phone, linens/towels available upon request, wood burning fireplace, gas grill, picnic table and wood swing, 2 car garage. Sleeps 8. Master bedroom has private full bath and 2 sets of bunk beds. Additional sleeping, second bedroom with 1 queen size bed, sunroom with day bed with trundle, and queen size sleeper sofa in living room, and a second full bathroom. Activities: Great fishing and swimming right off the 80 ft dock with 8'x8'platform. Beautiful area for hiking and biking in the summer, and winter offers great ice fishing and the best snowmobile trails in the north. The property boasts 115 ft of lakeshore offering plenty of room for outdoor meals and fun. Only 20 minutes to Traverse City, a quick day trip to Mackinac Island, and a short drive to Sleeping Bear Dunes. The lake was beautiful, not crowded and very peaceful. The cottage was a little older and probably needs some updates in the kitchen and bathrooms. The beds were comfortable and clean. It was nice that you did not have to bring any kitchen supplies, since they have all that you can possibly need to cook with, except things like paper towels and foil. Overall it was a nice stay and we enjoyed our time. Only drawback was that it did not have air and we had my father there that used oxygen, so it was a bit stuffy, but the fans that were supplied helped. Great experience. Will recommend to everyone. It is a nice house with two bedrooms and very cute living room. On the kitchen you can find whatever you need, with only one requirement put everything back, but it is not big deal. Gas grill is directly connected to Natural Gas line that made our dinners awesome we didn't worry about a tank of gas. The backyard is big and has a wonderful fireplace with view on the lake. The lake is not so small it is 1 mile in all directions and you can use a canoe to cover this distance a couple of times if you wont. I will highly recommend this place to stay for more than two nights because you will enjoy the rest at this beautiful and silent place.